The story starts starts with, Oops sorry there is no story in the movie so I should re-phrase my sentence. 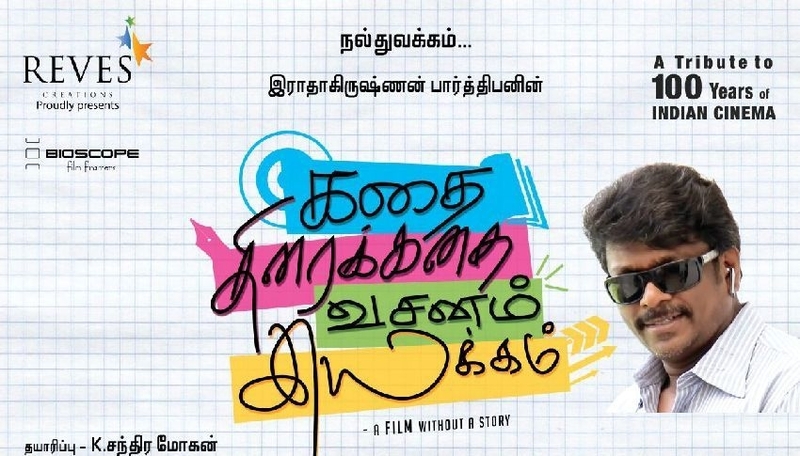 The movie starts with 3 different scenes enacted by Vishal, Vijay Sethupathi and Tapsee. There is no connection between any of these scenes. The viewers are completely baffled. The fourth scene connects the first 3 scenes and then the movie starts. See the movie from the beginning to experience what I am saying. The movie is about a person who is aiming to be a director. He is in a story discussion with his friends. He is being disturbed by this friends, situation, location, his wife and then neighbor. In between all these confusions, he creates a story for his movie. As mentioned in the promotions, this movie does not have any story but they make to sit and watch. Usually in a movie, you will recognize the people who does the main role but you cannot recognize the people who does the supporting characters. In this movie it is completely opposite. You know all the supporting actors but not the people who does the main roles.All the actors are new except Thambi Ramaiah. The hero of the movie is Parthibhan. Well he has not acted in the movie but he does appear in the screen to make his directorial touch or change the path the movie travels. His dialogues and screenplay does really near special mention. He tells the 7th scene after 4th scene, 8th after the 6th scene. He has completely muffled up the scenes but it is interesting to watch. குறும் படம் எடுக்கும் குரங்கு பசங்களா!!! விழுந்த வடை ( it is not a spelling mistake) பழைய சாதம் தான் பிரியாணியவிட பெருசு. என்ன பழைய சாதம் சாப்பிட ஒரு நாள் காத்திருக்கணும். Thambi Ramaiah is another backbone of the movie. Without him the movie is not there. He has done some good acting and dialogue delivery. The best was fainting after checking after checking the diabetic sugar level in RSA secure id. The movie is different in all aspects. No story and muffled up screenplay. You should watch it. Don’t walkout of the theater when they start showing the title scroller at the end because the climax of the movie is after the scroller ends.